The story of the game with an attractive name ”poker” started over ten centuries ago. It includes different games based on domino combinations or ranked card using “bluffing” in order to disorient opponents. They widely believe that a similar to poker game was figured out by the Chinese around 969 A.D., in time when Mu-tsung (The Emperor) and his wife have played “domino cards”. During the 12th and 13th centuries Egyptians have used card games, in 16th century they used Persian “Ganjifa” or “Treasure Cards” for various betting games. Persian people played “As Nas” as well, which combined 25 cards, hand hierarchy and rounds. A Spanish “Primero” game was popular in 16th century as well. Later in 17th – 18th cent there were two widely- spread games: French “Poque” and German “Pochen” game. A principle part of all these games was bluffing, i.e. holding low cards with the aim of disorienting opponents. Primero though is rated as a “mother of poker”, while it is the very first game similar to modern poker. The game was imported to Canada by French colonials. The Poque was a very popular game of France, it spread from Louisiana to the Mississippi and then throughout the country in the 18th cent. Jonathan H. Green is the first to write references to poker by mentioning the “cheating game” of Mississippi riverboats in 1834. It was arrival of poker. It was also extremely popular among soldiers in the course of the Civil War. This game which was in great request and had lots of variations has never lost its popularity over two centuries. To learn how to play poker it would be good to browse at least some basic poker rules and obey simple poker tips. Entering a game you are to make a full buy-in depending on a certain game. Before dealing the cards, it is required to shuffle and cut the pack. It is recommended to get three people in place of two involved. The cut should leave minimum four cards in each share. The bottom card is not to be shown to anyone. For that purpose a cut-card is used (for example a joker). You fold or declare to be folding as facing bet or raise. You throw a hand away making another player to act behind you. As facing a bet you take your upcards off the table, put them facedown, or blend your up- and downcards. The hand doesn’t include the proper cards number for that poker variant. You act upon a hand with a joker as a hole card in game without using a joker. As facing a bet you got a clock on you, or raise/exceed the time limit. Cards in the muck may be considered to be dead. Cards thrown into hand of another player are dead, regardless of being faceup or facedown. A player shows all the cards in the hand face-up on the table with the aim to win. The dealer helps reading hands but the players must hold their cards till the declaration of the winner. Players get two down cards (holecards) and the round of betting goes after it. They turn simultaneously three board cards (the flop) and one more betting round starts. The next two board cards are turned in turns, and a new betting round is after each card. A player is free to use any five-card conjoining from the board (which are community cards) and personal cards. A player can use even no personal cards, but all of the board cards (it’s called “play the board”). They use a dealer button. A standard poker strategy is to use 2 blinds, but using one or multiple blinds, an ante or the conjoining of an ante and blinds is also possible. Betting – when and how? Betting is a key to online poker. 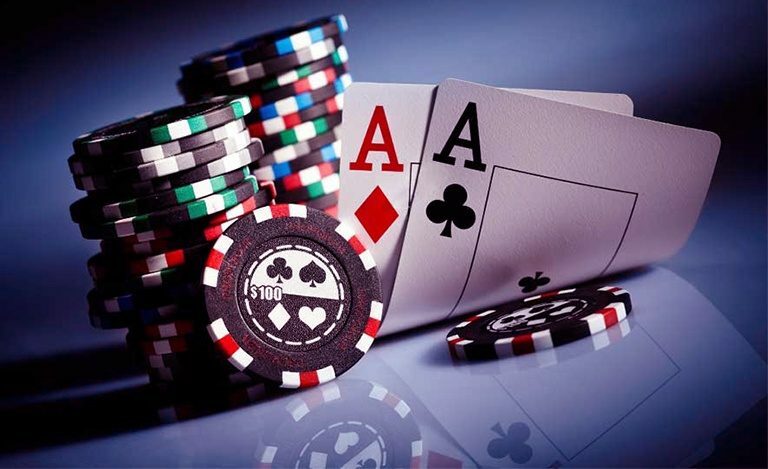 The players have a chance to bet on their hands during one or more betting periods over the course of poker deal. Poker requires such skills as minimize losses through poor hands and maximize your winnings through good hands. Each player might be demanded to make an initial contribution, so called “ante” when the cards are not dealt yet. Each round starts as a player, in turn, places a bet of one or possible more chips. Every player to the left is to “call” that previous bet by adding the same chips number to the pot. Any player can “raise” the bet by adding more chips, or “fold” it by adding no chips into the pot and discarding his hand, i.e. he is out of the betting until the next deal. A betting round is over as each player adds as many chips as previous players or folds. Usual amount of rounds for every deal is 2 or more. As the last round is over each player remained in game is to show his hand face up, that is called “showdown”. The best Poker hand gets all the pot. A player has an opportunity to get the pot not even showing his hand in case he makes or raises a bet no one else calls. However, poker is a common game thanks to bluffing, i.e. the top card combination doesn’t always win! A player is entitled to just “check” with the aim to stay in game and not betting. It is called making a “bet of nothing”. There is a necessity of setting a game time limit while the game might last too long.